It's a little early to run this post again, but it's worth the effort to spread the word about this great new market on the west side of Tokyo. The Earth Day Market itself isn't new at all, but this branch of it in Kichijoji is. The organizers try to set up markets around town to spread the word about good organic food and to bring such things to more and more places. Not only is it a little Earth Day every month, as one vendor said, but it's a nice bit of community as well. Good food grown by people passionate about their work never fails to inspire pleasure, and that's exactly what visitors to this market (and the others this weekend) will find. See you there! There's a new market in town, and let's just say I'm excited. 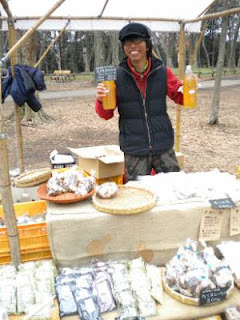 The Earth Day Market, held monthly over in Yoyogi Park, is one of my favorites, and so when the market manager, Tomiyama-san, told me a 'branch' market was starting up in Kichijoji I was thrilled. The Earth Day Market is all organic, all fair trade, all the time, and the only downside is that it is once a month. So yesterday, two days returned from our month in America, we battled jet lag and biked on over to check out the new market. There at the western end of the park we found a bundle of vendors braving the chill of a cloudy Sunday to greet customers with their usual selection of good food and sustainable products. 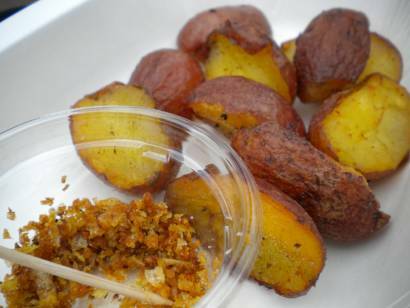 BioFarm's most yummy roasted potatoes. Many of our usual favorite vendors were there - Cocira with her most excellent bamboo charcoal cleaning product, BioFarm with the usual selection of beautiful greens and the scrumptious roasted potatoes pictured above, Kitagawen with their lovely organic teas, and Miyamotoyama with their mouth-watering homemade mochi, miso, and natto - along with a bundle of new folks selling everything from plants and seeds to jewelry, jams, an assortment of grains, vinegars, miso and shitake, along with jewelry and yarn. Busy in spite of gray skies, it's easy to imagine this market shaded by the big trees in warmer months and full of people doing a bit of shopping before venturing to the zoo or a stroll around the pond. 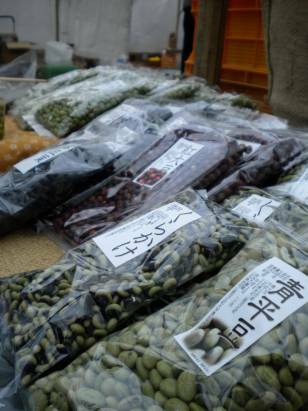 Come on out to one of Tokyo's hippest spots to enjoy the park, pick up some groceries, and support area farmers! Directions: Head out the South exit of Kichijoji Station towards Inokashira Park. As you come down the steps to enter the park proper, turn right along the pond. Follow the path along until you see an option to head up the hill on the right. Head up the hill, and there at the base of the walkway leading to the zoo and under a grove of trees you'll find a friendly bunch waiting to help you find the vegetable of your dreams. There's plenty of bike parking there, too!